- 50% is the average of your eight acceptable prerequisite courses (taken during acceptable full-time semesters, minimum 75% to be considered further). Applicants choose which courses are put forward, as long as they are acceptable. Prerequisite courses can be from any acceptable semester including those in first year. The OVC admissions committee reviews the applications of the top applicants to verify that they are suitable for interviews. Candidates who are invited for an interview will receive an email the last week of April. The Multiple Mini Interview (MMI) is modelled after the Objective Standardized Clinical Examination (OSCE) and was developed by the Michael G. DeGroote School of Medicine at McMaster University as the interview tool for admissions to their MD program. The MMI consists of a series of short, timed, structured interview stations that draw multiple samples of a candidate's ability to think on their feet, communicate opinions and ideas, critically appraise information, and demonstrate advanced understanding of issues facing the profession. A number of papers have been published illustrating the reliability and validity of the MMI. During the OVC MMI, candidates rotate through a series of eight stations. Seven stations are scenario-based while one is based on information contained in your Background Information Form. There are two assessors per station who evaluate the student based on a scoring rubric. All stations assess communications skills. Applicants move between interview stations in a circuit. Each station lasts 10 minutes: two minutes to read over and consider the scenario followed by eight minutes in which to discuss the scenario with the interviewer(s). The non-academic skills assessed by the MMI reflect the educational goals and objectives of OVC, as well as the skills identified by the veterinary profession in Ontario as being necessary for a successful career. 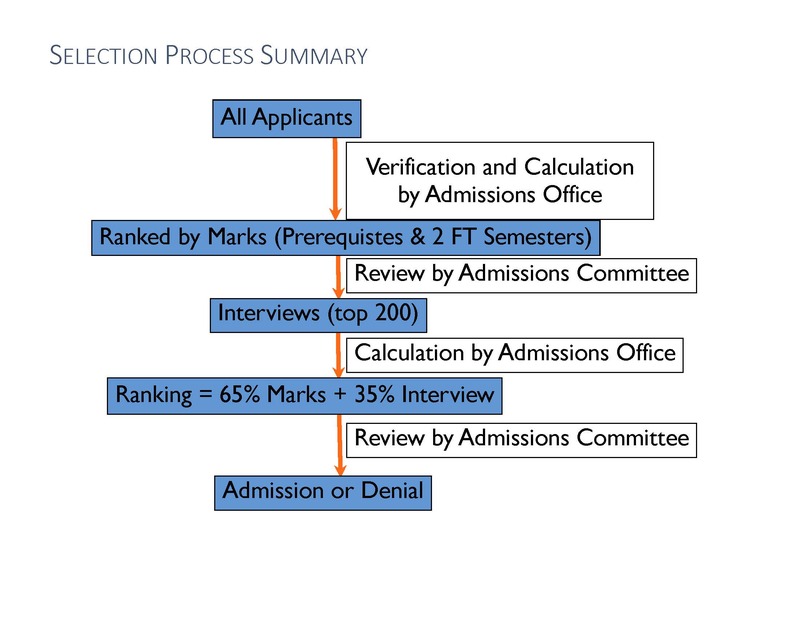 The interview score becomes 35% of the final ranking and is combined with the admissions average calculated in step 1 above (which is now 65%). For the domestic undergraduate pool, the top 200 applicants are re-ranked with the combined score. Please note that all domestic undergraduate cohort interviews are held on site and no virtual interview or interviews outside of the planned week are permitted. Individuals applying as part of the graduate student cohort are interviewed separately usually in June. The top 100 undergraduate domestic students are reviewed by the OVC Admissions Committee, and the applicants who will be offered acceptance into the program are chosen. As soon as the admission decisions have been made, they will show on the applicants' WebAdvisor accounts. An official letter will be mailed to each applicant at their mailing address and an email will also be sent to the uoguelph email address. Offers of admission must be accepted in writing.